The Vault contains stuff that is too smalI to list on my main pages, but still might be useful. These are mainly small additions to my portfolio. Feel free to check them out. Lots of my projects that didn't made the cut and were abandoned early in development process are now yours for the taking. Most of these are being able to run with the free version of Game Maker 8.1. All of these are presented without guarantees (use at your own risk! ), with the hope that someone will find a use for them. To download a game's source files, just click on the image to start downloading. The file format of the source is stated in the caption text. Duplicreate, Panic Puzzler, Pong With Lasers, and Unnamed Strategy are under the MIT Licence, (C) 2012-2014 Tom 'Amazingcookie' H. All other files are still under copyright, although exeptions are possible by contacting me. Floating Islands - Mainly working with shades of gray and blue, this was a puzzle platformer at heart. The main gimmick is switching dimensions. Spikes some interesting idea's, like throwing paper airplanes as attack and very cool menu's. Contains the game's tutorial, one near-complete level and one smaller level. .gm81 available. Unnamed Strategy - A strategy game for one player against the CPU. Programming the CPU, however, was the reason for stopping with this game. The player characters (three) can move either in eight directions or do a dash in four directions. Dashing seems like a dominant strategy, but there's a cooldown that increases with one turn each time you use it so you'll only use it in emergency situations. .gm81 available. GLITCH - A game where you can (intentionally!) glitch through one block thick walls, creating a very weird platforming game. Features a VVVVVV-like camera flick and this basic platform 'glitch' engine. Also writes an .ini save file when run which perfectly shows the scope I had in mind for this game. .gm81 available. Pong With Lasers - Does exactly what it says on the box... A pong game with lasers. Adds -quite literally- a new dimension to the oh so well known classic. .gm81 available. Duplicreate - A draft for a two player top-down strategy game involving duplication. Early abandoned because I couldn't see it becoming a fun game. The goal of the game would be to take over as many tiles as you can. .gm81 available. ORB - Highly inspired by BIT.TRIP VOID. You control this big floating orb with your mouse. Pressing the left button will make the orb red, middle blue, right green. You can only collect the blocks that are the same color as you are. This project was also scrapped because of level design issues, which was mainly done via time lines. .gm81 available. Panic Puzzler - A puzzle game, where you push two identically colored blocks together to make them vanish. Go play Blockwick instead. .gm81 available. My first game projects, most of which I'm not super proud of (anymore! ), but are included anyway for completion's sake. ​Usually from 2012 or before. Seed in the Sky - My first game. It's an arcade game based on one of the microgames in Warioware Touched! .gmk available. Change Forms - A kinda weird exploration game. Collect three unique powers, inspired by Kirby's copy abilities, and features four levels. 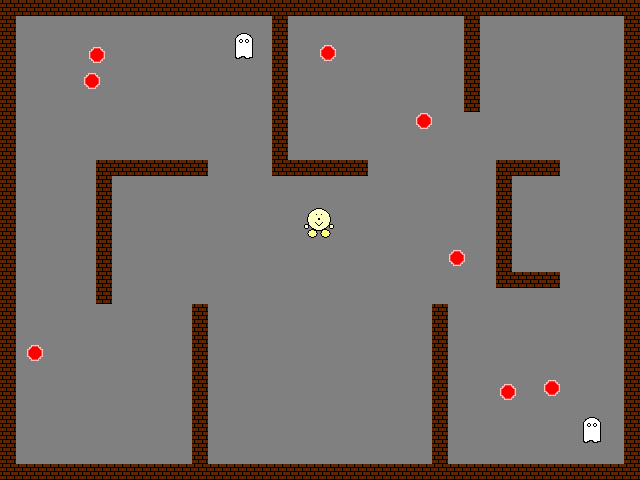 The first game to feature guest levels from Casper "Superpatat" H. This one is a zipped executable. Piko Runs - Not gonna lie, after looking back on this source code three years later, I laughed out loud. Ghosts and gumballs are bouncing from the walls. I guess it's obvious which ones to avoid and which ones to collect. .zip with game and source.